Training at your location. Customized curriculum tailored for you based on your group’s skill level and an assessment of your data. In-person, instructor-led classroom training with extensive hands-on activities. We maximize the impact of Tableau training courses by customizing the curriculum to make sure we cover the topics that are most relevant to your group. Learn Tableau skills in days rather than weeks, so you can start turning your data into insights that drive action as soon as possible. 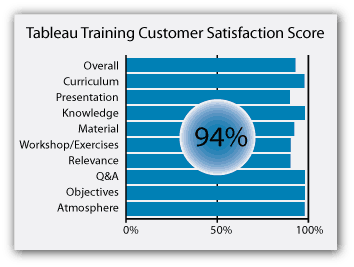 Our Tableau Training gets a 94% satisfaction rating from customers including: Bayer Health Care, CAA, Pepsi, CIBC, University of Toronto, Ministry of Natural Resources, Telus, Canadian Tire, and M&M Food Market. Gain fundamental skills to visualize your data, use a wide variety of visual types, connect to data, create basic calculations, build interactive dashboards, share visualizations, and more! Combines aspects from both Essentials and Master training. This 3 day course will introduce you to the basic features and functions of Tableau. It adds an additional day to the regular 2-day Essentials course to explore more complex and advanced Tableau capabilities. An accelerated Tableau Master Training course for those who have completed the Tableau Essentials Training course or equivalent and are interested in more advanced topics. Enhance your basic skills and learn to build complex, dynamic visuals in this advanced course for experienced Tableau users. We will do deep dives into the nine different types of filters in Tableau; advanced table calculations; dynamic, multi-level sets; level of detail expressions, custom mapping, and multi-pass table calculations. In this 2-day course you will learn skills to prepare and shape data in Tableau Prep. You will gain experiential knowledge of what data works best with Tableau Desktop and how to shape and clean it to derive maximum flexibility from Tableau Desktop. Learn how visual design impacts the effectiveness of a dashboard. Designed to ensure business analysts have a basic understanding of Tableau and know how to define requirements for new dashboards, this course will delve into specific best practices for dashboard performance, visualization, and dissemination. Unilytics Tableau training and consulting has been excellent! The instructor was passionate and engaging which created a great atmosphere during the training. He was extremely knowledgeable and very responsive to all the questions that were asked. We conducted a survey of training attendees and they reported a high satisfaction in the training. The course content fitted perfectly with our needs and was a great launch pad for tableau development. 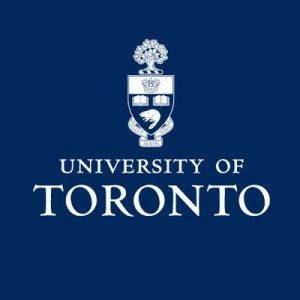 Would highly recommend Unilytics. The Tableau Essentials training was FANTASTIC! Both instructors were knowledgeable, engaging, and responsive to all of our questions. The course covered a LOT of material and definitely showed us the possibilities – we are very excited about that. We will be reaching out shortly about taking the Visualization Best Practices course! The Tableau training Unilytics provided to us was invaluable. It opened up a world of options that we didn’t know existed. Tableau has become a game-changing tool for our office and has helped us meet the demands of our stakeholders more efficiently. The training was fabulous. It really hit the mark in terms of what the users needed to see around the fundamentals. The trainer dazzled the group on the 2nd day by analyzing our data and showing never-before-seen insight using some keen analytic functions within Tableau. Our highly skilled instructors are certified in Tableau and are professional Tableau consultants. As such they understand Tableau functionality as well as how it is applied in the “real world” of business.